An SOSKY volunteer recently drove to Frankfort to attend the Public Pension Oversight Board Meeting. 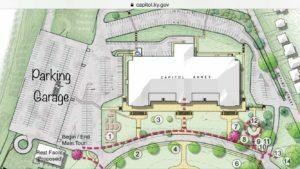 Along the way, she documented her trip to show you how easy it is to visit the Capitol Annex building. 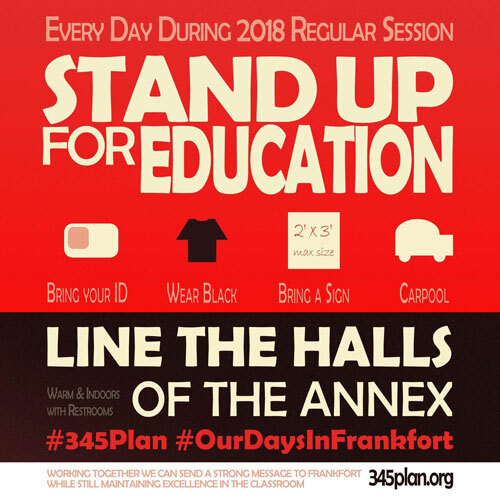 Join us starting on January 2, 2018, for #OurDaysInFrankfort by participating in the #345Plan and do your part to #StandUpForEducation! 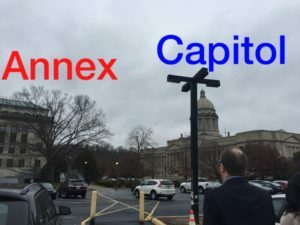 Here is a summary with photos of a visit to the Capitol Annex Building in Frankfort. Traveling West on I-64, I took Frankfort Exit 53B. 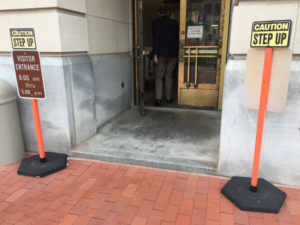 From there, I ignored the directions of my GPS and instead followed the green signs posted along the road which led me easily to the Capitol Parking Garage. 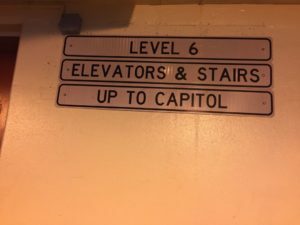 (Note: Your GPS will take you to the Capitol Building, but it may lead you to the open air parking area instead of the under ground parking garage.) The parking garage was not crowded, so I parked near the elevators on the first level that I came upon which was level six. Level 6 is the bottom level of the parking garage. Next, I took the elevator up to level 1 which is the top or ground level. While walking to the elevator, I met up with some strangers who seemed to know where they were going, and I breathed a sigh of relief that I could follow them. Here a map that shows an overview of the parking area and the Annex. The parking garage is underneath this open air parking area. Signs in the parking garage. Exiting the elevator at Level 1, I walked out into open air with a view of the Annex building ahead, slightly to the left and the Capitol Building ahead and to my right. The crosswalk goes through an open-air parking lot where many of the legislators park. I happened to see Representative James Kay parking his car and we exchanged friendly waves. View walking from the parking garage to the Annex & Capitol. 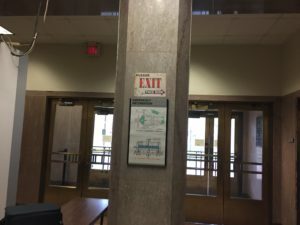 Following the crosswalk to the Annex, I approached the building from the side, walked up some steps, and then continued to the center set of doors where the security entrance is located. Nearing the security entrance, I reached into my wallet to get my I.D. There were only two people in line ahead of me, but I know on some days security is very busy. As I walked inside, I sat my bag down on the table and pushed it up toward the guard. Then I stepped through the metal detector. As I was handing my I.D. to the guard, I realized that I had actually pulled out my credit card instead of my drivers license (force of habit, I guess). We had a quick laugh and I quickly exchanged my credit card for my I.D. The guard wrote my name down on the visitors list, returned my I.D., and I picked up my bag from the table. After passing through security, I noticed the staircases on my left and the elevators on the right. However, the committee meeting rooms are all on the first floor. So I proceeded straight ahead down the hallway. Almost immediately I noticed the bathrooms on the right–how convenient! After a quick stop, I continued on down the hallway. The hallways were clearly labeled showing which room numbers are down which hallway. 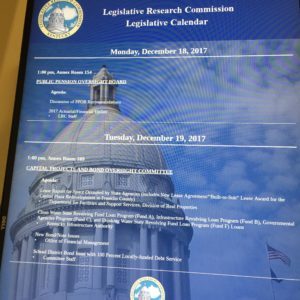 In addition, there were small electronic screens that showed all of the meetings on the agenda for that day and their corresponding room numbers. I checked the screen to ensure that the room number had not changed and followed the signs to room 154. To my relief, I arrived 30 minutes early, without getting lost, and there were still seats available! Close up of the screens in the hallways of the Annex. One thing I forgot to do was sign up to make a public comment to the members of the board. Next time, I will make a note to ask someone how to do that. Only one person signed up to speak at this meeting and each person is only allotted three minutes to speak. Two hours later, the meeting was over. I talked with some of the legislators and other audience members before reversing my steps back to the security entrance of the Annex. Exiting the Annex at the Security check-in. Perhaps next time I will have the boldness to follow some legislators back to their offices in the Annex or take the tunnel over to the Capitol building to visit the Governor. I learned that the Annex and the Capitol belong to us, the citizens of Kentucky, and are staffed with friendly people. While I was there I saw two children sitting in the meeting room with us, one woman knitting while she listened, and another person sharing cookies. Driving out of the parking garage, I noted that parking is free. For someone prone to anxiety in unknown places, like myself, this trip turned out to be easy and stress-free. I plan to make many more trips to the Annex and the Capitol. See you there!